Experience an amazing day on the Miami waters with this unique Jet Ski tour. Your knowledgeable guide will point out unique and amazing sights only seen on this tour. This action-packed tour around Miami is the perfect activity if you are looking for excitement and experience in the waters of the Atlantic Ocean and Biscayne Bay. 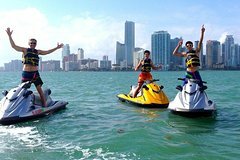 Cruising along on a top-of-the-line jet ski, you will follow a friendly and knowledgeable tour guide as you see a variety of different hot spots along Miami. You can follow your tour guide as closely or as distantly as you want, as you get to control the speed you travel. As you ride along, the tour takes you through the beautiful waters of the Atlantic Ocean. On this tour, you will have plenty of time to enjoy the thrill of riding on a jet ski. Also, don't forget to keep your eyes open during the tour, as you are sure to catch glimpses of many curious wildlife including dolphins, manatees and birds.